"As we start to transition from generation to generation, so do our gadgets. In fact, our gadgets seem to evolve at breakneck speeds at the moment. One perfect example is how we listen to our music. We now have dozens of music streaming services. Not just that but we also seem to be doing away with the shackles of wired headphones and devices in favor of using wireless Bluetooth connectivity." This little Bluetooth gadget by Mpow is one of those rare intersections of durability, performance, and affordability. I was a bit skeptical that a dongle this cheap would provide clear sound quality, good battery life, and last for more than a few months without breaking, but so far I’ve been supremely pleased on all fronts. Made with Bluetooth 4.1/HFP/HSP/A2DP/AVRCP connectivity, the Mpow boasts a 33 foot connection range with minimal signal lag and plugs into your favorite audio equipment using a standard 3.5mm aux plug connection. One of my favorite features of this little guy is that you can actually have two devices connected to it at the same time – not that many receivers offer this functionality, and it’s super nice to have for anyone who’ll end up sharing it or using it in a community space. It also features automatic connectivity after you’re paired up, and an advertised 8 hours of battery life off of one 1.5 hour charge. In my personal experience, the battery life and connection range are pretty dead on. I never use my Bluetooth that far away from the receiver in the first place (I have one for my car and one for my stereo setup at home), but I’ve actually gotten 10+ hours of use off of one single charge – I’d be happy with half of that! Update: There is a newer model of this available that also serves as a transmitter, which is linked below and pictured above! My favorite thing about the Esinkin adapter is how sturdy it feels for being such an affordable little piece of hardware. They designed it quite well, making the whole thing a sturdy little square with the pairing button directly on top of the unit. It does utilize wiring instead of having a 3.5mm jack built directly into the unit, which is always a tradeoff – it’s a bit more hassle and takes up slightly more space, but you don’t run the risk of snapping the connector off by accidentally bumping or jostling the receiver around. You do need to keep the Esinkin plugged in so you don’t have a battery to worry about, but it’s obviously intended to be more of a stationary receiver for a stereo set in your home as opposed to a portable car unit or anything like that. It does come with the A/V to 3.5mm cable you need to operate it which is always nice. Range is advertised as up to 50 feet, which I’ve found rather accurate in my own use! 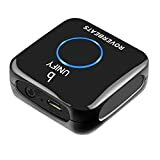 This 2-in-1 bluetooth transmitter / receiver by TaoTronics is one of the smallest adapters out there – perfect for anyone who hates bulks dongles cluttering up their otherwise-perfect cable management and electronics organizations. Basically anything you might want to do involving Bluetooth, the TaoTronics can help you with. Stream Bluetooth to your car? No problem. Pair up your non-bluetooth TV with a pair of wireless headphones? Absolutely. Stream music from a CD player to a set of Bluetooth speakers? Not sure why you’d want to do that, but you sure can! This TaoTronics comes with both an 3.5mm to 3.5mm aux cord as well as a 3.5mm to RCA cord, along with a charging cable. One full charge gets you up to 10 hours of consistent use, and I’ve found the maximum stream range to be more than adequate for any use case you can think of. This battery-powered adapter from Etekcity is a slick little dongle. Design-wise, I think it’s one of the better-looking Bluetooth receivers out there. It’s quite small and sleek, and looks right at home among any grouping of electronics or in any car. It can stream up to 33 feet, and boasts a 10 hour battery life along with rapid recharge capability. My favorite part of this Etekcity model is how versatile the connection options are. You can connect aux to aux, aux to RCA, aux to A/V, and pretty much anything else you might need when getting set up. It also feature NFC compatibility, which is not totally necessary but is still wicked cool. Basically, if you have an NFC-enabled device, you can simply touch your device to the adapter for an instance Bluetooth connection. I’ve found this to work quite reliably, and sometimes even more so than a typical Bluetooth pairing process. Play Audio Easily: Enjoy streaming media from Amazon Music, Apple Music, Spotify, Pandora, iHeart Radio, Tune IN, and SiriusXM on your iPhone/iPad, Android Phone, PC, tablet, or any Bluetooth-enabled devices. Similar to the Esinkin adapter, Logitech’s 980-000910 also comes backed by the reputation and quality associated with the Logitech brand. 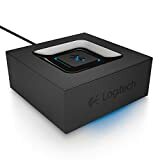 Mulitpoint connectivity – pairing more than one device at a time – is a huge attraction of this Logitech adapter, as you can have two smartphones, a phone and a table, or whatever other configuration you may want all hooked up and ready to stream music at the same time. It takes a lot of the hassle out of having to disconnect and unpair / repair different devices, which is always a finicky and frustrating process. The 980-000910 is not battery powered, and hooks up to speaker systems using a standard RCA to 3.5mm cable setup (the A/V cables go into the unit, and the 3.5mm cable jacks in to your speakers). All cords are included with the adapter. Logitech claims a 50 foot connection, and I’ve personally used it up to 40 feet or so with excellent results – I’m sure the 50 foot claim is backed up in practice, although my house isn’t large enough for me to make use of those last 10 feet. Buy a new AV set for your home. However, this will set you back around $500 depending on the quality and brand of the stereo you will be purchasing. There is also the case of your old stereo being perfectly fine which sounds like a waste. You can connect your smartphone to your audio system by using a 3.5mm jack which is not the most convenient method. Why? Well, you will need to plug in and plug out your device manually to the stereo if you want to listen to your music. The final solution is to buy a Bluetooth receiver which will allow your AV system to get an instant wireless connection with a quick set-up. This also means you can walk around your house with your smartphone and still blast your favorite tunes. Oh, and you won’t even need to put down hundreds of dollars as Bluetooth receivers are quite affordable. A Bluetooth receiver acts as a bridge between, say, your smartphone and an audio system that is not Bluetooth capable. See also affordable Bluetooth ANC headphones. Chances are you already have a pretty neat AV system setup in your home, but it might not be wireless ready – which means you will need to manually connect jacks and converters every time you wish to play a song from your smartphone to your stereo. With a Bluetooth receiver, you can quickly connect your phone to your stereo and start streaming songs with a press of a button. Most Bluetooth receivers can stream music for up to 30 feet without any lag. It is also user-friendly and easy to set up. Most receivers even feature a plug and play design that allows you to start streaming from the get go without the need to program or install various apps. So, before you decide and get a Bluetooth receiver of your own there are several factors you will need to consider first. Do you need it to be compatible with speakers or with Hi-Fi systems? Will you be using it a lot? How far are you to the receiver when listening? Remember that the Bluetooth range is vital for good quality audio. Will you be hooking up the receiver to different stereos or to just one? How important is audio quality to you? Do you prefer easy to use functionality? Is warranty important yo you? Those are the questions you will need to take into account when choosing a Bluetooth speaker. Answering those question will help you narrow down the type of receiver best for you. Now that we have the basic questions out of the way, it is time for you to know what features look for in a Bluetooth receiver. 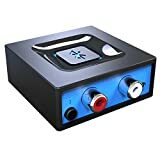 To the layman, having some impressive numbers displayed might make them believe that this Bluetooth receiver can deliver high-quality sounds, correct? Well, it is not as simple as that. You shouldn’t base your decision on the power alone. It has sub-categories that you need to consider first. RMS – The quality of the power should not be based on its peak but in its RMS. RMS or root mean squared refers to the sustained power of the receiver over a period of time. The peak is basically the maximum output but you can’t expect the receiver to deliver peak performance all the time. You need to look at the average which is what RMS is. An RMS with 150 watts is a good number to go by. Bandwidth – Having a high power rating can be achieved by putting the frequency to a low-stress test for a short period of time. If you find one that has a 100×5 at 1kHz then chances are it was tested under low-stress conditions. Look for one that shows a 20Hz to 20kHz rating as this is most likely tested under real world stress conditions. All Channels Driven – Look for a receiver that has this feature in order to ensure that there will be no dip in audio quality if you decide to connect to an AV system with several speakers. If your receiver has an All Channels Driven rating then it will produce equal quality audio on all speakers. Impedance – This refers to the electrical resistance of your Bluetooth receiver. Most home Av stereos have an impedance of around 8 ohms. Some manufacturers will try to sweeten the pot by claiming great power rating while driving an 8-ohm load to their receiver. Most will only display 8-ohm power rating which is basically short of false advertisement. To make things simple, if you see a 4-ohm rating on the device there should be an 8-ohm rating beside it as well. The other half that you should look for in a Bluetooth receiver is the THD. THD will help you determine how good the audio output will be. You should look for THD ratings that stay below 0.08. A rating of 0.1 delivers low-quality sound while anything higher than that means you better look for something else quick. 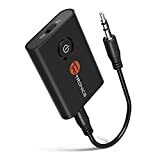 Now that you are armed with the understanding of key features you need to look out for you will have a better chance of picking a high-quality Bluetooth receiver. Remember that you should also check the reputation and customer review of the device as well. A Bluetooth receiver can be the perfect solution for those looking to integrate streaming services into their home audio system. Just remember to look closely at the numbers presented in the device. Knowing what to look for in this area will help you avoid the bad batch.